How to cook yummy Stewed Pork Bee Hoon? Simple recipe included! Yesterday, I was toying with the idea to cook stewed pork bee hoon for my colleagues, something which I have cooked a few times. I was torn between sleeping longer and cooking so I decided to let my body clock decide. Surprisingly, I woke up without alarm clock and in time to cook the dish for breakfast. I always use pork leg with mushrooms and chestnuts. The mushrooms and chestnuts go very well with the bee hoon. Somehow, I find pork leg more fragrant than pork chops. Nothing beats pork fats. 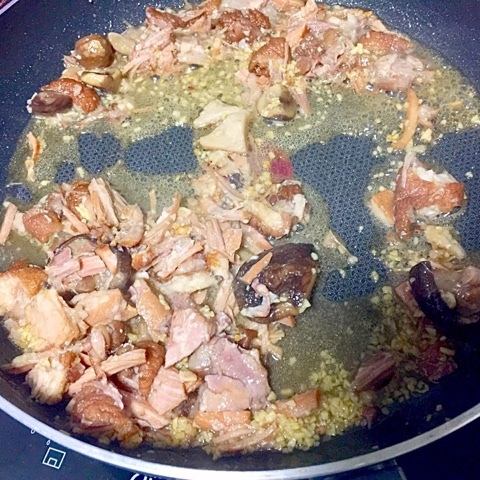 To prepare the canned pork, I removed all the bones and separated them into smaller pieces with a fork and spoon. To prepare the sauce, I removed the top layer of fats when I opened the can. I also added a small amount of water to the sauce to make it less thick, making it easier for the bee hoon to soak up the sauce. 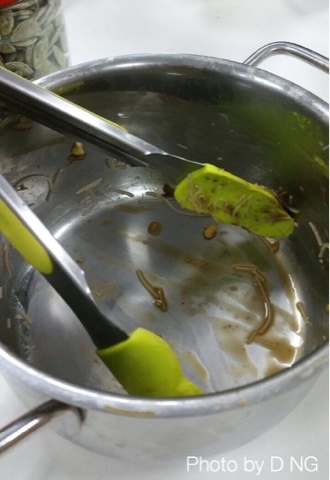 To prepare the bee hoon, I soaked them for 20 minutes. Soaking is important because properly soaked bee hoon helps to achieve the right texture and it releases the fragrance of the bee hoon as well. I oiled a large non-stick frying pan and added chopped garlic. Next, I scooped out all the meat, mushrooms and chestnuts from the sauce and fried it with the garlic. At this stage, I took care not to add sauce to it. The point of it all is to fry the pork with the garlic until there is a strong aroma. Once done, it was time to add the bee hoon that had been drained of excess water. I gave it a good fry and it was time to fry the eggs. 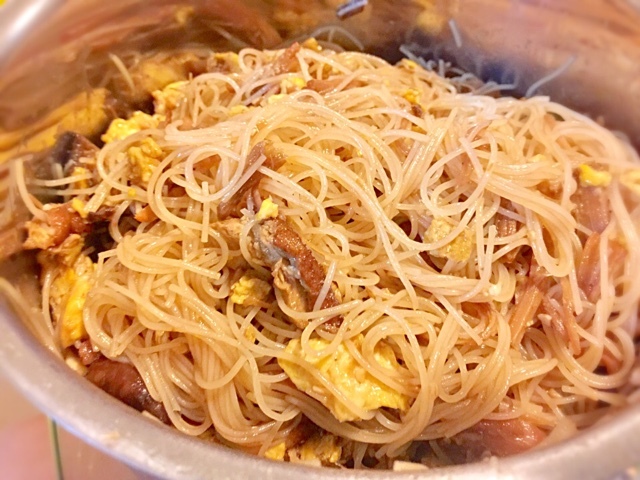 I pushed the bee hoon to one side and fried the eggs. 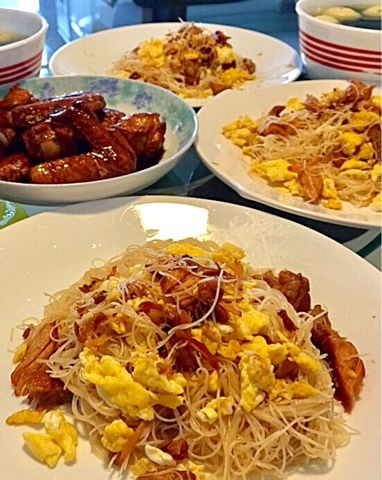 I mixed the bee hoon, eggs and pork with a pair of chopsticks. If you don't want the taste of stewed pork to be that overpowering, you can add cabbage. I prefer the taste of stewed pork to dominate the dish so the best vegetables is Cai Xin or Xiao Bai Cai. Cabbage releases water when cooked and it has a distinct taste. Cabbage cooked with white rice, mushrooms and meat is another recipe that I have tried in the past. It was time to add the sauce! I added the delicious sauce and mixed it with the bee hoon. The bee hoon would soon absorb the sauce. I added dark soya sauce from Tiger. Dark soya sauce would increase the fragrance of the bee hoon and give it a nice colour. I remembered that one of my colleagues like strong flavours so I sprinkled some salt onto the bee hoon. George Calombaris from Masterchef Aust always says that we must add a little salt to enhance the flavour. I was so engrossed in sprinkling that I forgot to taste! It was too salty for my liking and I decided to add some hot water to save the dish. That was the only way. I was very disappointed. I switched off the stove because the bee hoon would break into small pieces if I continued to cook it. I knew that given time, the bee hoon would be able to absorb all the moisture. Thank God it did so! Send me a picture! Happy Cooking!